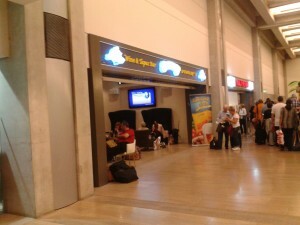 UPDATED: No matter how much you fill yourself up on food while on vacation in Israel, you’re bound to get hungry when you face a two hour or longer wait at the airport before your flight home. 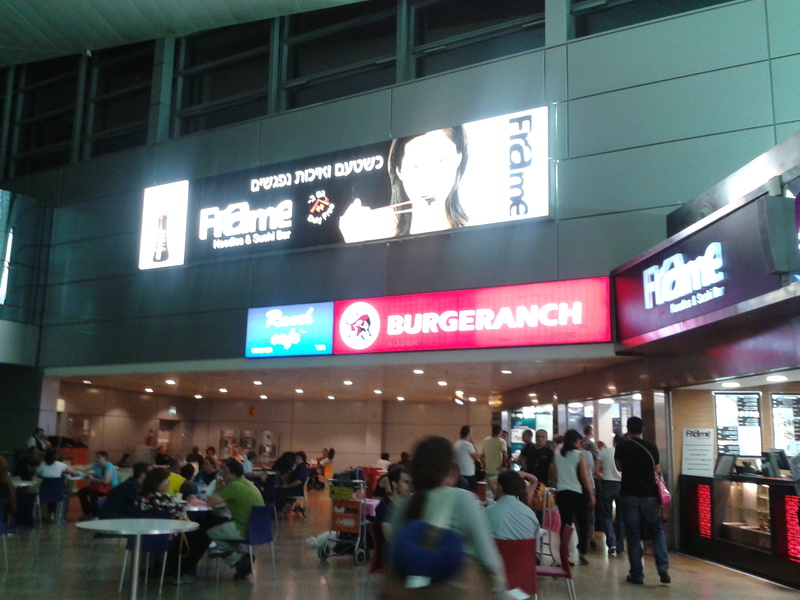 Of all airports in the world, Ben-Gurion is probably the most kosher-friendly, but not every offering is certified kosher. The variety of food available is modest, but has just about enough to satisfy your whole family’s needs, from a burger and fries to pizza or just a cup of coffee and a muffin. Here is what I uncovered when I visited at the end of October 2012. There are two basic sections of the airport: before and after security. Before passengers go through security but after they check in and check their luggage, there is a large seating area with a variety o f stores and a few restaurants. This is where you can sit with those not traveling anywhere – and get a little more time before you have to say goodbye. Burger Ranch – a large burger chain serving typical fast food fare of burgers, fries, chicken nuggets, hot dogs, sodas and a few salads. Pizza Hut – On the other side of the hall, if you don’t want burgers you can get pizza – or a few pasta dishes and salads. 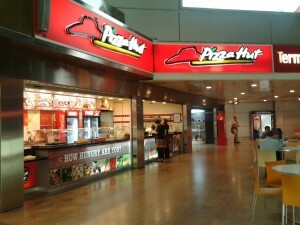 Both Burger Ranch and Pizza Hut are open 24 hours except for Shabbat. 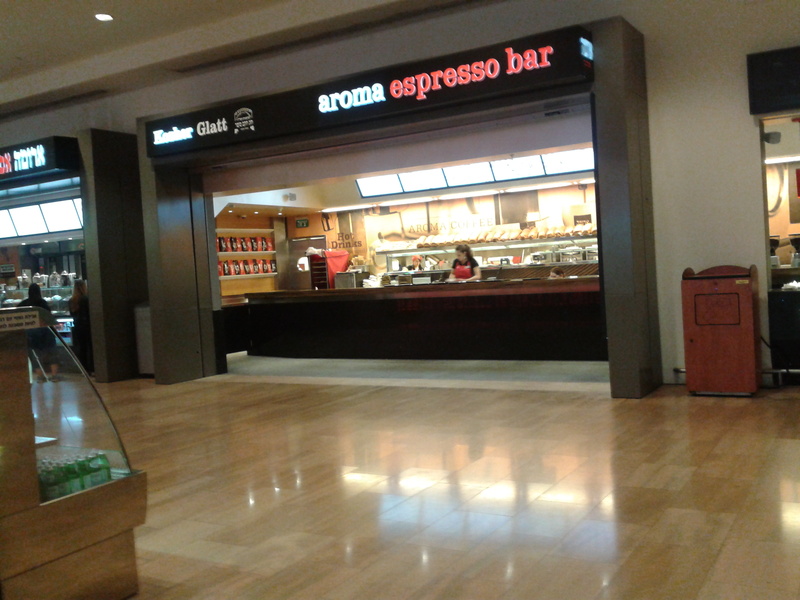 The Arrcaffe chain located in both sections of the airport has kosher certification, but is open on Shabbat. Burger Ranch – Yet another Burger Ranch, with the same menu, is found on the other side of security, in the food court, which has ample seating. 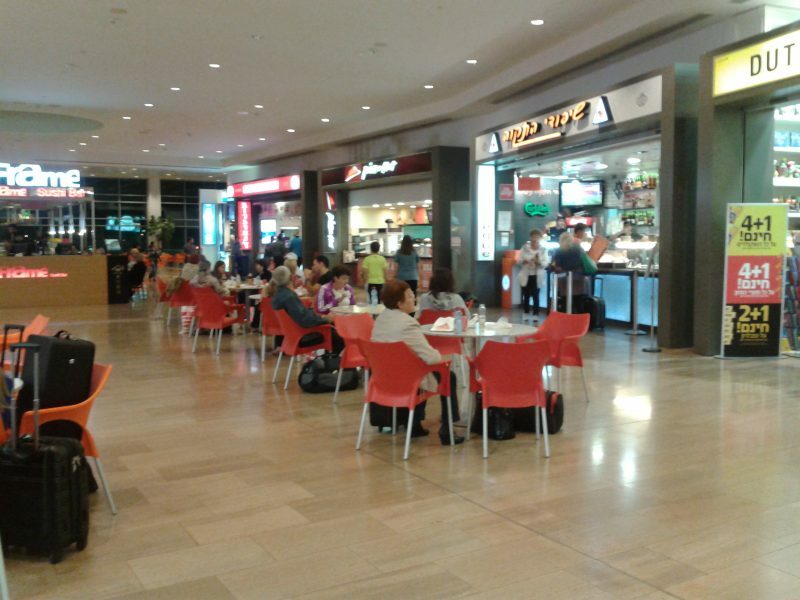 Shipudei Hatikvah – This branch of an Israeli chain restaurant is also open 24 hours except for Shabbat, and serves typical Israeli food, including hummus, falafel, chicken, burgers and schwarma. There’s also a small kids menu available. Aroma – There is a large Aroma Espresso Bar in the food court area, with a wide variety of drinks, salads, soups, pastries, sandwiches and more. Shmoozy’s – This bar and eatery just opened two months ago – separate from the food court – as reported on by YeahThatsKosher. It offers a full bar menu of wine, beer and tapas including hot dogs, tortillas, nachos, salads, and chicken skewers. The Frame Sushi stand in the food court did not have kosher certification as of October. Note: There are a large number of duty free shops selling all sorts of chocolate and other food. Many of these products do not have any hashgacha. Some of those that are imported may be kosher without hashgacha depending on the country of origin. Please take care when purchasing items in these stores – just because there is Hebrew writing does not make it kosher. Even if it’s a product you’ve had before – say a KitKat – it might not be kosher if it is imported from another country.